For all your dry material sifting needs. Powdered Sugar, Cocoa, Milk Powder, Flour, Granular Sugar, Cake Flour etc. Fits on your bench or optional stands available. Output for flour is 50 lbs per minute. The F-A-S-T, Easy, Efficient Way for all your dry ingredients. Ball Bearing Continuous Duty – completely enclosed 1/3 horsepower at 1140 motor for long life. On/Off switch in convenient location. 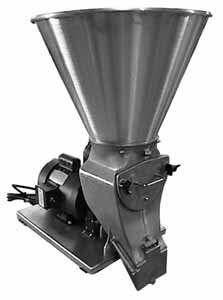 Heavy gauge aluminum-spun hopper for no unsanitary seams. Sanitary open lid on hopper. Heavy Duty Nickel Plated Steel Base. Heavy rubber pads keep sifter in place. Heavy 20 gauge stainless steel sifting screen for extra long life. None Painted All aluminum castings for sanitation. FDA approved Roulon Sleeved bearings for long life and sanitation. Oil light bearings on connecting rods. Screen is easily removed for cleaning. Motor single phase 110V adaptable to any location with any standard outlet with ground plug. All parts have been precision machined for accurate alignment of bearings. Motor mounts require no shims. Protect against damage to expensive paddles and whips. "Compact, fast, easy to clean, safe for anyone to operate. I just love it!" "It is a great sturdy little machine that we use everyday for all our cake flour and powder sugar. It's well worth the money." These are just a few comments from people who are using our machine. What will your comments be?